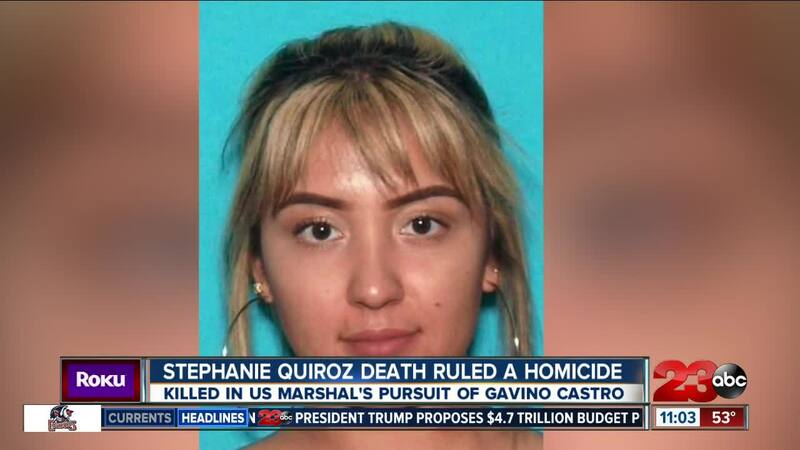 21-year-old Stephanie Quiroz shot in the chest last week following officer involved shooting last week. As of now, it's unknown who shot Quiroz. BAKERSFIELD, Calif. — The Kern County Coroner has identified the victim of a traffic fatality on March 5. According to officials, 21-year-old Stephanie Areanda Quiroz was a passenger in a vehicle that crashed at Brundage Lane and Oswell Street just after 4 p.m. on March 5. She died at the scene. Prior to the crash, the vehicle was involved in an officer-involved shooting in the area of 8200 Brundage Lane. Following a postmortem examination, the cause of death was a gunshot wound of the chest and the manner was a homicide.